Before you read any further absolute apologies for crap photo. 1 kg slab pork belly – our piece was about 800g, plenty for 2 of us! 8 long green spring onions, trimmed, cut into 4cm lengths – no spring onions, subbed shallots, which I liked but Mr MWCED says try spring onions next time. Whatever…. REMOVE skin from the pork belly and slice thinly into 1.5cm – 2cm thick rashers. Then slice each rasher into 4 cm wide strips. MEANWHILE, combine soy sauce, stock, mirin, sake (or wine), sugar and pepper in a small saucepan over medium-high heat. at this stage I tasted the marinade and added a little hoisin and sweet chilli sauce, which just toned it down a little, probably because I had used dark soy sauce. Bring to the boil. Reduce heat to medium. Simmer for 5 minutes or until sauce has reduced and thickened slightly. Allow to cool completely. PLACE sliced pork in a glass or ceramic bowl. Coat with half the cooled sauce. Cover and leave to marinate in the refrigerator for at least an hour. THREAD pork and spring onions – or shallots or anything that takes your fancy – onto skewers. Place onto a paper lined tray. no paper lined tray for us, as you can see, straight onto the BBQ plate .Brush with some of the reserved sauce. PREHEAT bbq or grill on medium-high heat until hot. 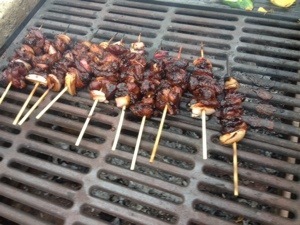 Grill skewers, basting with sauce, for 6 to 8 minutes or until cooked through. We lucked out with a warm still night so BBQ was perfectly timed. Added some BBQ zucchini (yep still picking plenty from the garden) and crispy potatoes which had already been parboiled, together with a fresh salad. And Mr MWCED approved.